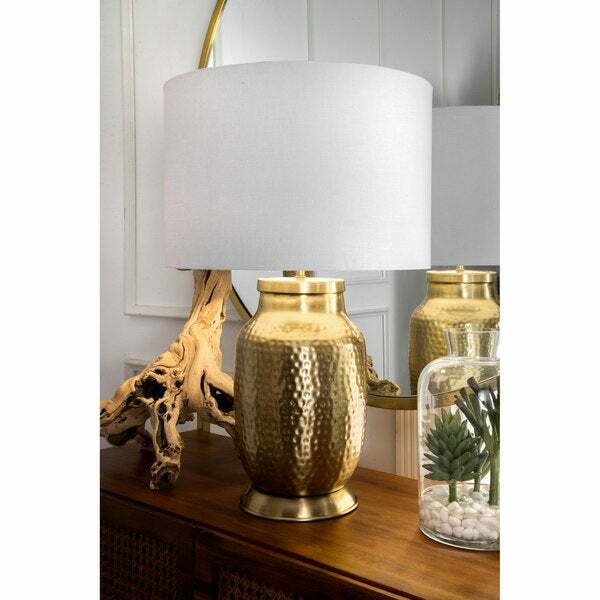 Safavieh Lighting 18.75-inch Medford Table Lamp - Gold - 10" x 10" x 18.75"
Let your room shine with the addition of this modern, 23-inch high, Iron table lamp. It has a Cotton shade that delivers bright ambient lighting. Add an vibrant flair to any room with its Brass finish. Received the lamp on Tuesday. The look of the lamp was somewhat disappointing, as it has a seam running horizontally along the middle of the lamp, giving the appearance that two pieces were sottered together. The lamp also arrived without a harp, which is necessary in order to connect the shade to the lamp. From afar the lamp appears seamless, but looking close you do see it. "what are the dimensions for the lamp shade?"